Our first farmers market of the season is in less than two weeks, and we could not be more excited. This year, the Broadway Sunday farmers market is moving to an amazing new location at the corner of Broadway and Pine, a super busy corner in the center of Capitol Hill’s business district. The old location was sweet and cozy, but invisible to the crowds of pedestrians that throng Broadway on summer Sundays. In the new spot, we’ll be right out on the street in front of Seattle Central Community College, visible from blocks away. Opening day is Mothers Day, May 8th, at 11 AM. Now all we need are some vegetables to harvest. We’ve had our eyes set on this date from the minute we drove the first post for our greenhouse, back in January. We moved to a new farm this winter, after we suddenly and unexpectedly lost access to the land we had been farming since 2007. In the last three months, we’ve basically started over from square one. We built three huge greenhouses, researched and acquired new tractors and implements, turned five acres of grassy pasture into fields of fertile soil, and fixed up a run-down farmhouse, all while doing the same work as normal for late winter – seeding hundreds of flats, transplanting, weeding, and watering in the greenhouse. So anyway, we’ve been looking forward to the first market of the season with a mix of excitement and anxiety. It’s always tricky to have spring-planted vegetables ready by early May, and we use a variety of techniques to speed up our early crops – starting them under lights indoors, covering beds of early lettuce with row cover, squeezing things into empty corners of greenhouses. Lacianato kale, seeded in January, transplanted to field in March. Keeping warm under translucent spun fabric row cover. 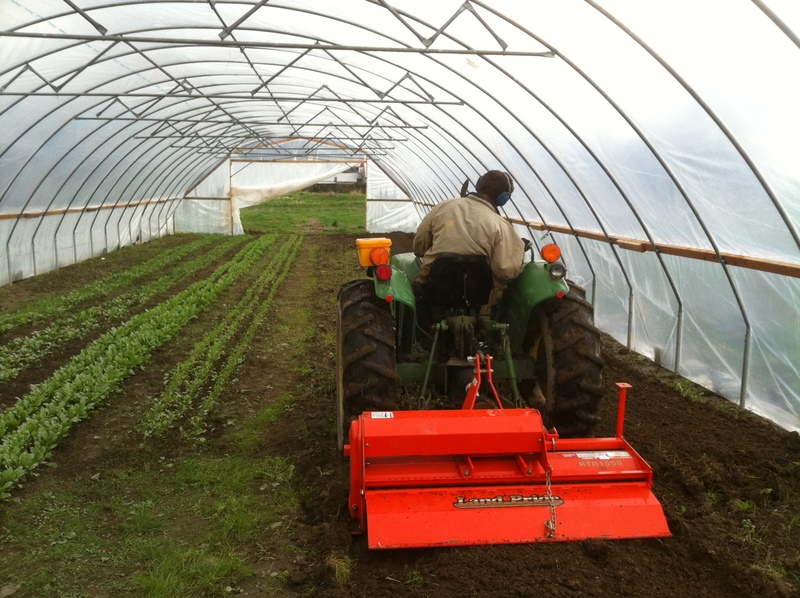 Prepping greenhouse beds for an April seeding of salad greens. March-seeded turnips and arugula on the left. Right now, we have some beautiful turnips that are about ready to pick, occupying space in a greenhouse that is scheduled for tomato plantings in early May. We’re hoping to harvest the turnips for the first market, and quickly turn around and plant the same beds to tomatoes. 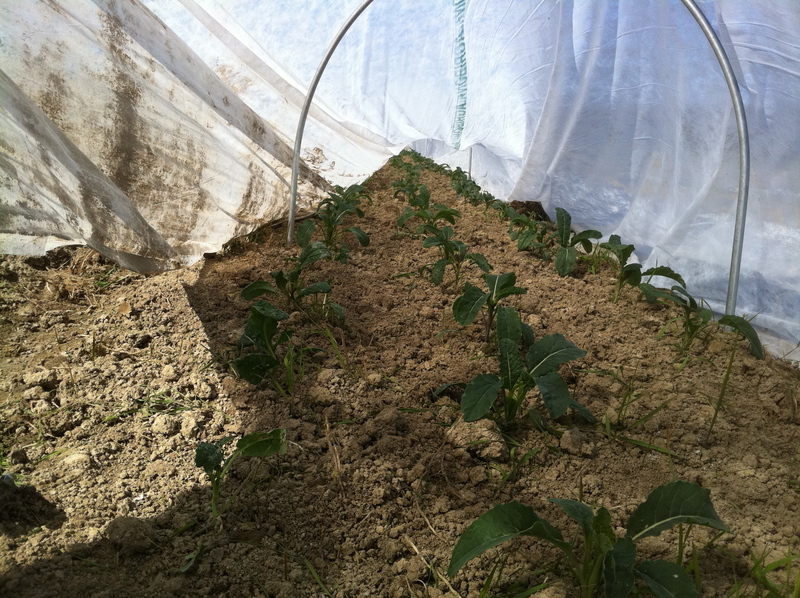 We also have some arugula and radishes in that greenhouse, also intended for the first market, but they grew too fast, and instead got sold to a restaurant last week. We’re keeping our fingers crossed for the first field-planted radishes to hurry up and grow in time for the market, and we also should have some spicy salad greens, baby heads of lettuce, and perhaps some tender pea vines. May farmers market, 2010. 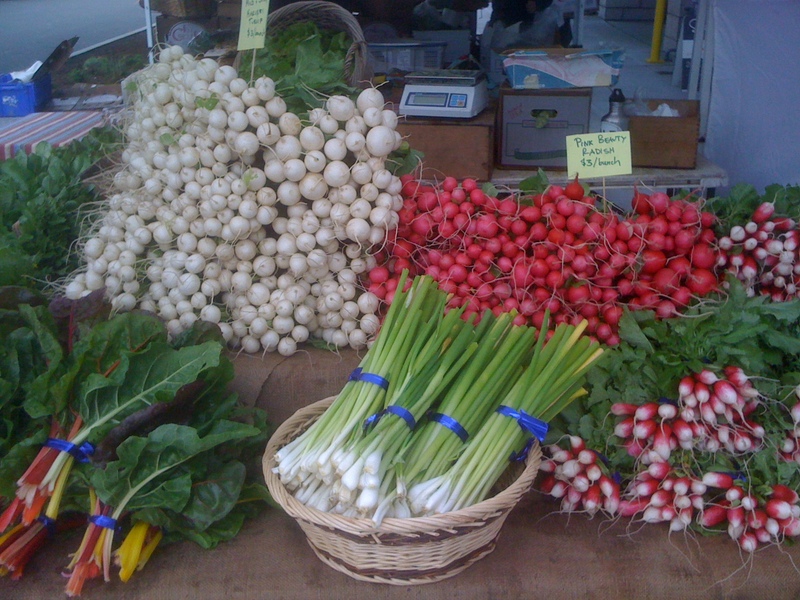 Lots of turnips and radishes, plus some magical rainbow chard from the greenhouse. At this point, a lot depends on the weather. Just a few days of warm sunny weather will give lots of our crops an extra boost, which could be the difference between having spinach ready to harvest for the first day of market or not. As I write this post this morning, the rain is falling steadily, and the forecast for the next week isn’t too promising, but either way, we’ll be at the market on Mothers Day. We can’t wait to see all our farmers market friends again! 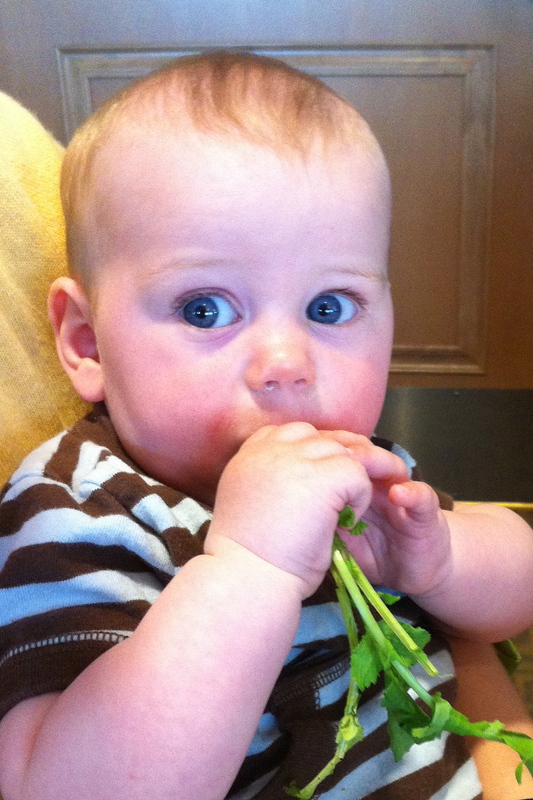 Farm babies use radishes instead of pacifiers. Thanks Daphne! We’d love to come to the Vashon market, but we’re usually pretty busy on Saturdays harvesting food for the Sunday market.